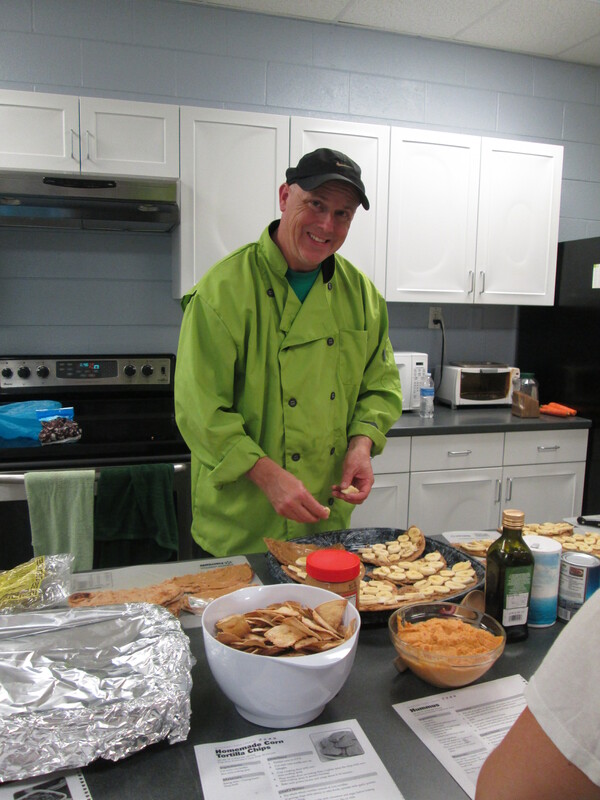 This week marked the end of our last six-week Cooking Matters course. Taught in conjunction with Inter-Faith Food Shuttle, the weekly classes were taught in English and Spanish, and focus on healthy eating on a budget...our patients are raving about all they have learned! Each class focused on a different area: fruits and vegetables, whole grains, proteins, and putting together a healthy meal on a budget. Part of each class is nutritional instruction -- where the instructor and patients discuss the nutritional content of the meals, -- and the second part is the practical cooking skills needed for each meal, including food and equipment safety. "Patients really appreciate the class," says Alliance's Wellness Program Coordinator Carina Saavedra. "They want to eat healthier and have recipes that enable them to cook fast, healthy meals for their families. This class really empowers people to make positive changes in their lives." Alliance patient and Cooking Matters student Gail Johnson couldn't agree more. "I'm so glad I went to the class! I was really struggling with my diabetes, and had tried a number of medications at Dr. Lewis' suggestion. My blood sugar level was over 300; now, after the class and making changes to my cooking and eating habits, my sugar level is, on average, 90, sometimes 80." Gail says she is loving cooking again, and looks forward to her dinners each day. "The biggest change I've made is that I'm now very aware of what I'm eating, when I'm eating it. The hardest time is from 7:00 until bedtime. If I want to snack then, I eat seedless grapes, raisins, or whole wheat crackers." 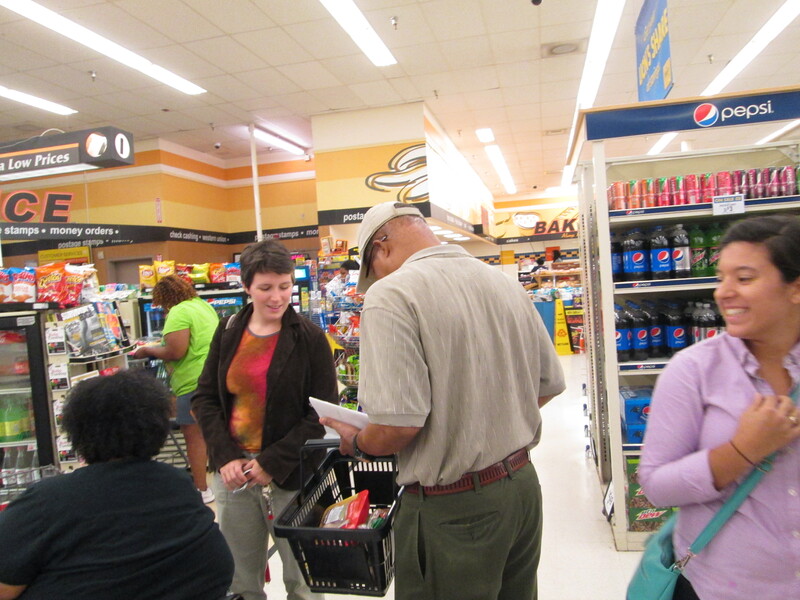 The grocery store tour is one of the highlights of the class. Wellness Program Coordinator Carina Saavedra says that the students "learn things you don't even think to learn about. The tour is broken down into sections of the grocery store. We talk about how the store is set up, why it's important to buy around the perimeter where the fresh foods are, and why they should steer clear of the center aisles, where more junk foods and expensive packaged foods are located." Gail says the information learned at the tour has stuck with her. "When I go to the grocery store now, I shop the perimeter of the store. I get to the check out, and there's no Hamburger Helper, no boxed food...all veggies!" 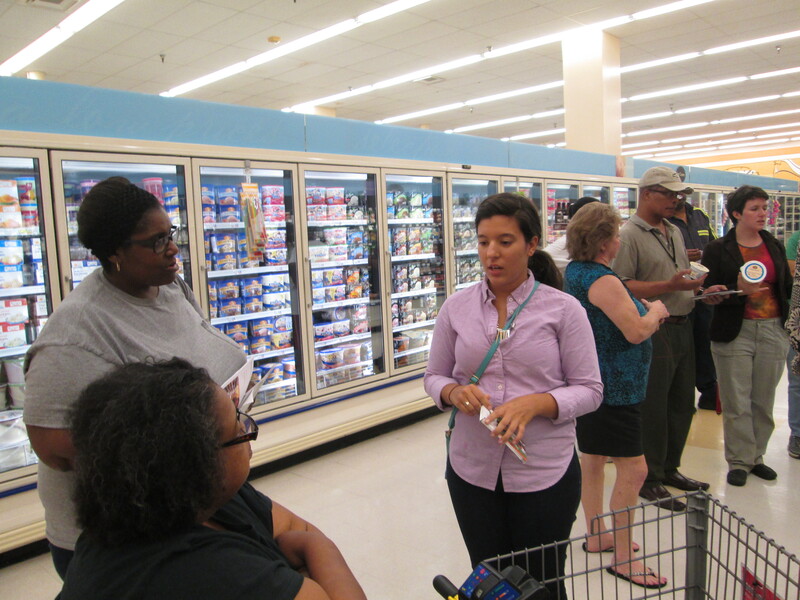 The tour included reviews of the canned and prepackaged foods. "We look at the convenience items, like prepackaged salad, and talk about the price benefits of buying a head of lettuce or unpackaged spinach. We compared fresh produce to canned and frozen produce, and packaged meats compared to other lean proteins like beans and eggs and Greek yogurts. We talk how confusing the labels can be for wheat, and learned that if it's not '100% whole grain', it's not actually whole grain," says Carina. At the end of the store tour is the '$10 challenge', where each person must create a meal for a family of four using at least three of the food groups, under $10, using healthy ingredients. "The patients got so creative! One dinner example used tortillas, salad, beans, peppers and onions. Another was a stir fry with pasta squash, zucchini, onion and white beans." Gail's eating and cooking habits have changed dramatically. "In the beginning of the class, they tell you to 'eat the rainbow'; well, my rainbow was brown and white, all meat and potatoes. Now I'm enjoying cooking fresh and frozen vegetables for dinner. I've almost completely cut out red meat; I mainly eat fish and chicken. One of the biggest changes I've made is that I've probably cut out 3/4 of the salt I use to use, and have been using seasonings. Chef Kevin told us about using Nature's Seasoning, Mrs. Dash, and olive oil. I've been doing that, and it's working. I'm not craving salt anymore!" At graduation, patients received a certification of completion, and take home a 'Cooking Matters' cookbook, take-home grocery bag, meat thermometer, cutting board, and notebook for their own recipes. Congratulations to all who participated! No time for grocery shopping? Problem solved! Allow us to introduce Relay Foods, an online grocer new to the Triangle that shares Alliance's love of "quality, healthy and sustainable" foods. With everything from grass-fed beef to local blackberries to gluten-free snacks, Relay has it all! Relay partners with local producers to provide fresh and homemade food produced within 100 miles of our city. Here at Alliance, our personal favorite are the Luna pops, made right around the corner in Hillsborough. Save yourself the time and hassle of your weekly grocery shopping by accomplishing it all in just a few clicks with Relay! Relay has multiple pickup stops in the Triangle throughout the week, including Raleigh Brewing Company, North Hills, RTP, and right here at Alliance. Here's the best part: over the next two weeks, Relay will donate $20 to Alliance Medical Ministry for every $50 of groceries you purchase! You must be a new Relay customer, and you must use the coupon code 'Alliance' at checkout. This offer is only good for two weeks, and only on the first order new customers place over $50. Click here for more details. Our wonderful volunteers who share their time, talent and treasure with Alliance now have a special name, The Busy Bees! 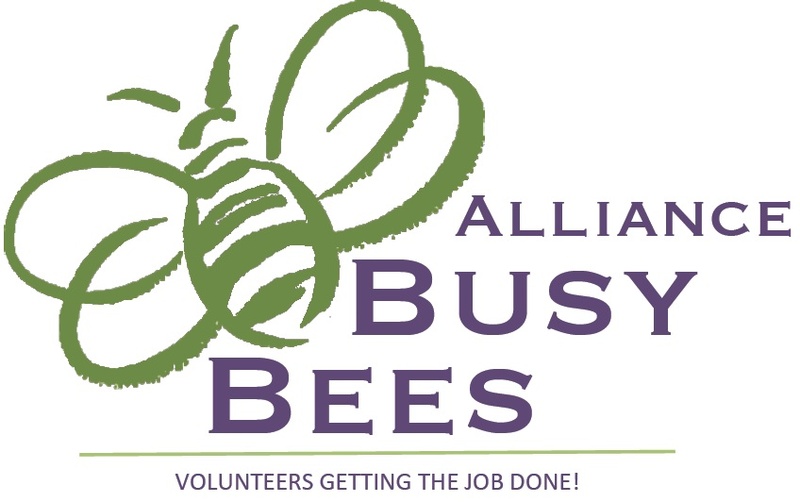 Alliance “Busy Bees” help us pollinate, grow and provide compassionate medical care for our neighbors. Below is a list of the awesome individuals who volunteered in 2013. Please join Alliance in thanking them for their service! If you would like to become a Busy Bee, let us know! Applications are online and are the best way to start the process. As you buzzzzzz about this opportunity, you can get the nectar flowing by considering the following sample. Community Garden: Help plant, weed and nurture our garden. We can work with your group to pick a special day, or come out on one of our regular work days: April 26, May 17, June 28, July 26, August 23, September 27, October 25, and November 22. Service Days: Come on-site and help with yard and building maintenance. Projects will be based on your group’s skills and interest. Clinical /Specialty Physician: Provide medical care to Alliance patients. Clinic Support: Provide nursing support by assembling charts, requesting medical records, completing medications paperwork, etc. Patient Services & Administrative Support: Assist Patient Services team with greeting patients, phone calls, mailings and general office support. Alliance “Ambassador”: especially at your church, to share the Alliance story, or as an Alliance representative at a mission or health fair. Development/Annual Fund Committee: Help with creation, planning and execution of annual giving campaigns. If you have special talents, skills, or interests not mentioned above, but want to volunteer at Alliance, please let us know! Contact Elizabeth Daniel at 919-250-3320 X 422 or edanial@alliancemedicalministry.org. *Names are based on logged hours. Stephanie Godwin, along with her husband and two boys, moved from New York to North Carolina for a better quality of life and to be in a family-friendly environment. They found exactly what they were looking for in Wake County! Stephanie takes care of their two boys, ages 9 and 11, while her husband works in the kitchen at a local Applebee’s. The company offers insurance, but the plans are still too expensive for an hourly employee. Stephanie and her husband do what they have to in order to make ends meet for their family. But then Stephanie ended up in the emergency room when her asthma got out of control. Luckily, she was referred to Alliance following discharge and now has access to doctors, medications and comprehensive care. Recently Stephanie looked into health insurance options through Healthcare.gov, She found that their household income is too high to qualify for Medicaid, but not high enough to qualify for healthcare subsidies. Stephanie and her husband are one of thousands of Wake County adults who fall into the healthcare coverage gap. Luckily Alliance is here for Stephanie and many others just like her. 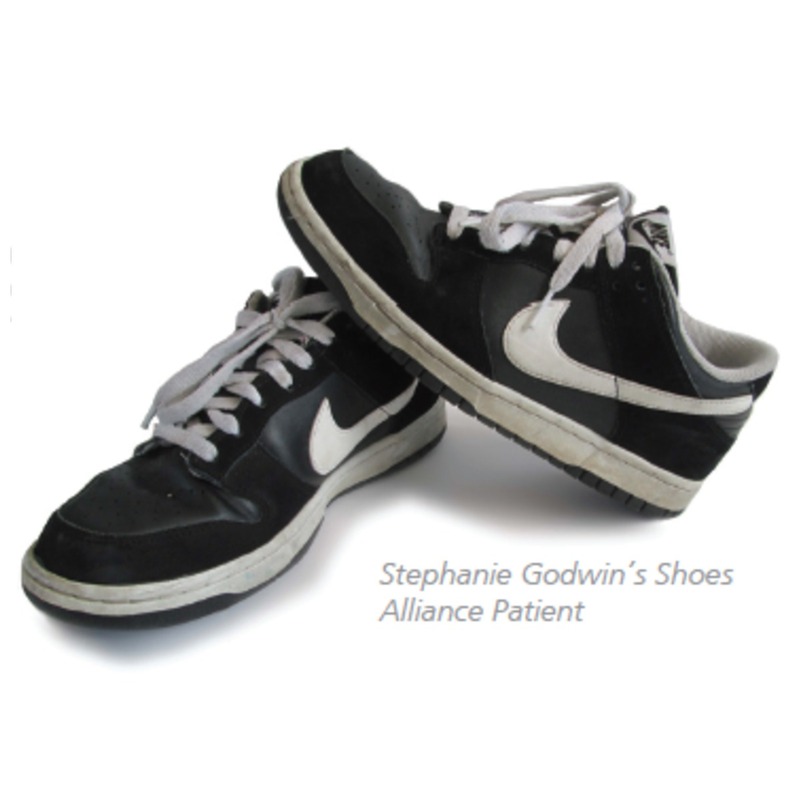 You can help provide a medical home to individuals just like Stephanie by participating in our newest event on May 1, In Her Shoes Women’s Leadership Luncheon. This event was created to highlight the fact that 68% of our patients are women. Click here to learn more! Healthcare Enrollment Fair this Thursday! Have questions about the Affordable Care Act/ Obamacare?Want to enroll in the Health Insurance Marketplace? Come to the Enrollment Fair! 1.Income Information: pay stubs or W-2 forms. 3.Social Security numbers or document numbers. 4.Information on current/available health insurance plans. You can also visit www.healthcare.govor call locally: 1-855-733-3711. We are hosting a second Enrollment Fair on March 27 at Alliance Medical Ministry. 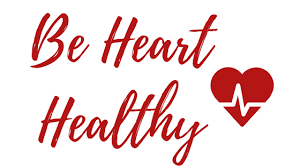 Daily, our providers take the time to counsel our patients on the proper choices to achieve better health outcomes: eat more fruits and vegetables, cut out fast foods, exercise more, take your medication, check your sugar levels, etc. We have found that it’s better to show our patients how to make healthy choices than to simply tell them. Alliance Medical Ministry provides a Wellness Programs that, when combined with our comprehensive medical home, gives our patients the tools they need to make lifestyle changes to improve their overall health. These pieces include the community garden, diabetes education, nutrition classes, exercise classes and group visits. By incorporating these options with our clinical care, we are not only increasing access to care, we are giving our patients the education and tools to change health behaviors and overcome social and economic factors. shared that 74% of our residents do not eat enough fruits and vegetables, and if your household earns less than $50,000 the likelihood of eating fresh foods decreases immensely. The average Alliance patient earns $19,907 for a household of three. Cost is an economic barrier to healthy eating. That is why we collaborated with the Inter-Faith Food Shuttle (IFFS) in 2009 to establish a community garden on the Alliance campus to offer fresh vegetables to our patients. Produce harvested from the garden is individually bagged, combined with healthy recipes, and handed directly to patients by their provider or nurse. 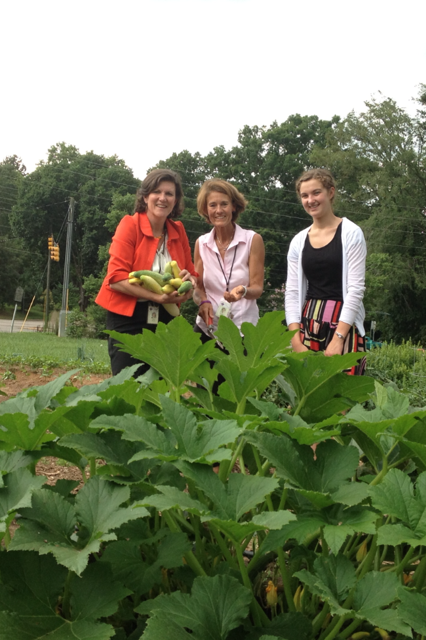 We are able to offer fresh vegetables to our patients, but more importantly teach them about healthy eating options. This reinforces the advice of providers and increases compliance. DIABETES EDUCATION CLASSES: To promote health behavior change and improve long-term outcomes for patients with chronic disease, Alliance started diabetes education classes to address both the educational and behavioral changes necessary to promote lasting change. In a typical office visit, our providers spend 20 to 30 minutes with a patient. That is not much time when you must address a variety of complex issues. By offering extra health education classes, our patients can learn about diabetes and how to manage their health on a limited budget. The added benefit is the peer support that occurs in a group setting. Patients see that they are not alone and learn from other patient’s questions. We also incorporate garden activities into our curriculum. Our Certified Diabetes Educators utilize the garden by preparing class meals, offered recipes, nutritional information and providing fresh vegetables to participants. Classes occur on Saturdays and are offered in English and Spanish. To incorporate the whole family in this program and to ensure that childcare is not a barrier, we are working with the Poe Center to offer a pilot kids program, “Growing Healthy Gardens,” while the Diabetes Education Class is occurring. This program will educate kids on where their food comes from and healthy choices. We are starting this pilot with three initial sessions with the hopes of incorporating it with all of our Diabetes Classes. 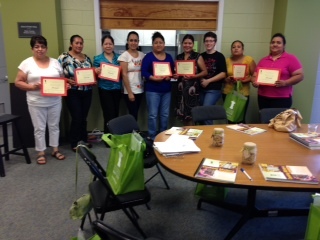 NUTRITION CLASSES: In the fall of 2013, we started nutrition classes that are fully kicking into action in 2014. Once again in partnership with Inter-Faith Food Shuttle we are incorporating their “Cooking Matters” curriculum into our Wellness Program. This program is an interactive nutrition education program that teaches families how to get the most nutrition on a limited budget. These courses provide a long-term strategy to address hunger by ensuring that families can prepare nutritious meals that are balanced, tasty, and economical. 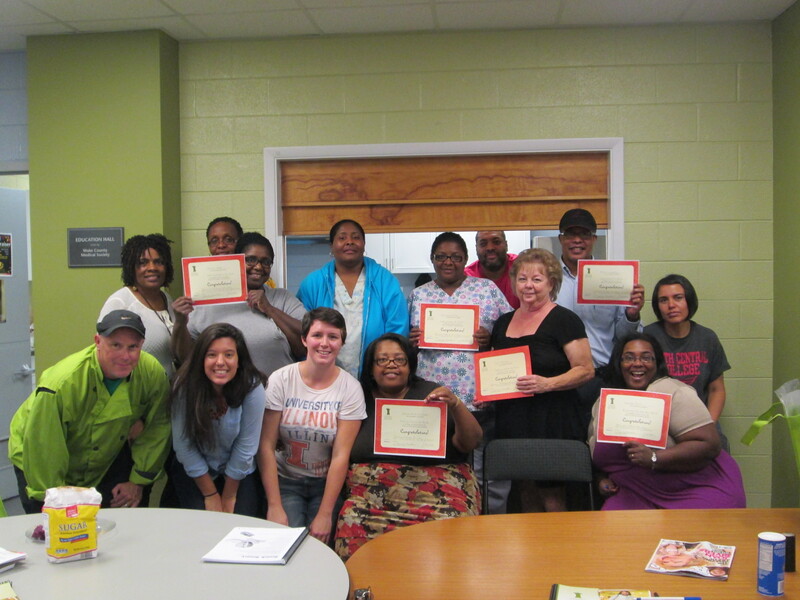 We have trained an AmeriCorps Member and other volunteers to offer classes at Alliance. EXERCISE CLASSES: Recently we also started a partnership with Dr. Howie Shareff of You Call This Yoga to offer adaptive yoga classes to our patients 20 times in 2014. His chair yoga classes allow all individuals to participate regardless of their athletic ability. The goal is to increase strength and flexibility while reducing stress. GROUP VISITS: The group visit is an extended doctor’s visit where not only physical and medical needs are met, but educational, social and psychological concerns can be dealt with effectively. Patients normally spend 1.5 to 2 hours at Alliance for a typical visit. With the group visit, patients spend the same amount of time at Alliance, but now get to participate in an educational component and interact with other patients. A typical group visit starts with 12 to 15 patients learning about a specific health topic as led by the provider or educator. It is an interactive setting where patients benefit from hearing each others questions and offer up their own advice. After the education session, the discussion continues with a facilitator while the provider sees patients individually. Our patients get increased health education and the benefits of a peer group setting. At the first group visit conducted at Alliance, the most popular saying from the interaction was, “me too,” after hearing other patients comments and questions. We have completed our pilot phase of this program focusing on our diabetic patients and are now seeking to expand with other providers in our practice and to add a group for obese patients. The pilot has shown improved clinical numbers for those that participated in the group visit verses those that did not. Participants reported a higher understanding of their disease, increased confidence to manage their health and increased exercise. At Alliance we offer compassionate care. We do not judge, but instead offer a medical home model that builds a relationship with our patients. By offering access to health education, peer support, fresh foods and exercise in addition to primary care, we can take away barriers in making lifestyle changes. The different pieces of our Wellness Programs give our providers options to respond to each patient’s individual needs and achieve greater clinical outcomes. Without this program, our patients would not have access to diabetes educators, nutrition experts or even exercise classes. With 78% of our patients dealing with at least one chronic health issues, these options help to affect positive health behaviors and overcome social and economic barriers.